A group is simply two or more individuals who come together to achieve particular goals. This means that they will interact with each other and will be interdependent upon each other. People who work in the same department or area within an organization, but don’t really interact with each other may NOT be considered to be a group. Basically, a group exists where the people within the group are able to influence (or be influenced by) other members in the group. Groups can be classified as either being formal or informal. A formal group is one that is recognized within the organizational structure. Generally it has been set up by someone in management in order to achieve particular goals. A formal group is likely to have a set representation of staff and some form of regular communication. Many formal groups will have a delegation to make decisions and/or designated work functions to deliver. An informal group is a group of people within an organization that have formed voluntarily, usually for social purposes, without any work or performance intentions. A group of friends at work would be described as an informal group. 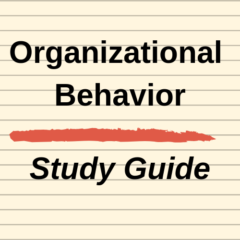 Both types of groups are important to consider in the overall performance of the organization. Clearly formal groups have the ability to deliver outcomes for the organization and need to be structured and managed appropriately, whereas informal groups will affect the culture and motivation and job satisfaction of the staff. An important point to note in regards to groups is that the individual’s degree of commitment to shared goals may differ. Just because an employee sees themselves as part of the group, they may/may not share the same sense of motivation, commitment and intention. For example, you may have an employee in the accounting team who takes pride in the performance of the area, where as you may have another accounting employee that takes the view that it’s “just a job” and may not share the first individuals level of commitment.